Thank you sir, that helped! btw. are there any chances for Linux JJ2+? At least somewhere in the future? Honestly I believe that most of the problems I'm facing / faced in the past are due to Wine. I really dislike Wine. This game is the only reason I have it on my computer, I don't use any other Windows stuff. Maybe that's a lot to wish for, I have absolutely no clue how hard would it be to make JJ2 and JCS Linux-friendly. Since there is no native JJ2 for Linux the only way for JJ2+ to be Linux-compatible would be for it to lose JJ2 as a dependency, which while not totally off the table is mostly a pipe dream at this point in time. 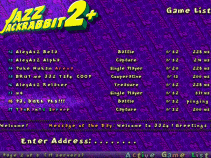 Not JJ2+, but Soulweaver is working on an open source clone of Jazz Jackrabbit 2, called Project Carrot. I haven't tried it but it should run on Linux. The JCF thread is here. I'm working on an open source clone of JCS called WebJCS, since it's made with web technology it runs on all platforms. See the links in my signature to version 1 (old and complete) and 2 (current, but in early stages). That error is likely from Wine not supporting part of Windows API used by JJ2+. Recent versions of Wine are believed to support all JJ2+ functionality. Please update and retry. Is there anyway to force Vsync on Window mode? I want to replace 800x600 with 800x450 as well. 800x600 no good and makes jazz too small. Edit: Its worth mentioning, I can easily zoom 800x600 and have 800x450 cropped. Bit the huds are missing unlike native 800x450. Unhandled exception: C++ exception(object = 0x0033f7f8, type = 0x102c5658) in 32-bit code (0x7b83936c). Installing more wine libs will probably help, I don't have this crash on up-to-date Arch. But are you sure about letting the exception through? Logface and I assume that JJ2+'s online check for self-updates fails here, even though Logface wants to start a singleplayer game. If this assumption is right, please catch and continue, you don't have to let the app crash. Can that API call throw in native Windows? Last edited by Simon; Mar 2, 2017 at 02:40 AM. We use a pure C library for the update check. If under any circumstances it can throw, I would find this fairly impressive in the first place, because it's C, and then I would say that's not something to discuss with us, but rather the creators of the library, because if a library to be used in C applications can throw, that's not a good sign. No, what we blame for the exception, based on earlier symptoms and when they occurred (regular Wine users reported the crash only in the latest release, while the update check has already been around for 5 public versions of JJ2+), is a far more substantial part of JJ2+, and letting the exception through is reasonable in the sense that if that part of code fails, the most we could do right now is display a custom crash message instead. The API function that we believe older versions of Wine don't support shouldn't throw unless its callback throws, which shouldn't happen under normal circumstances and no Windows user experienced it so far, to our knowledge. Okay, cool. Thanks for the extra info. I occasionally run the latest version of JJ2+ on my work MacBook through Wine (a recent OS X build) and haven't encountered any wrongful behavior compared to native Windows. Maybe Wine's even better, as both my gaming PC's are running Windows 10 with Nvidia drivers that still like to mess up DDraw to stutter, while I had Wine set to be like XP (which gives me a smoother, 60fps capped fullscreen somehow). Anyhow, using a recent build of Wine seems to be a good idea, at least. The full list of changes can be found over here. The first thing you'll notice is that we have an actual installer now (thanks Stijn! ), which should take care of the ongoing problem of asking people to edit parts of their plus.ini, jcs.ini, etc. files without overwriting the old files entirely. It'll also set up your jazz2:// protocol registration and give .j2l files some context menu options in windows explorer, if you let it. Besides that, this update is primarily focused on fixes for online servers and improvements to associated network code. Going forward, this new installer exe format should make us more comfortable with smaller, more frequent releases if other important fixes are needed in the near future, while putting off more major stuff for a version beginning in 6 instead of 5. Last edited by Stijn; Jun 2, 2017 at 12:05 AM. Apparently the new version indeed does not work on Windows XP (though it's worth trying if it works for you anyway). If you are still using XP you are stupid and deserve to lose your files to ransomware. It hasn't been updated or supported by Microsoft for years and it's full of security holes. That said, we'll try to compile a version that works for you, but it will probably take a bit of extra time. Yeah, I can confirm that. Just runs as regular JJ2. We decided to keep this because virtually all servers host on 1.24, and JJ2+ clients can join 1.23 and TSF servers alike, so server version doesn't really mean anything anymore. Is this why I can't see contents of 1.23 servers anymore through the SGIP? XP support is back in. But that's not anything new? My 1.23 servers in 5.4 were also reduced to "Version different." This issue started to occur about a week or three ago. 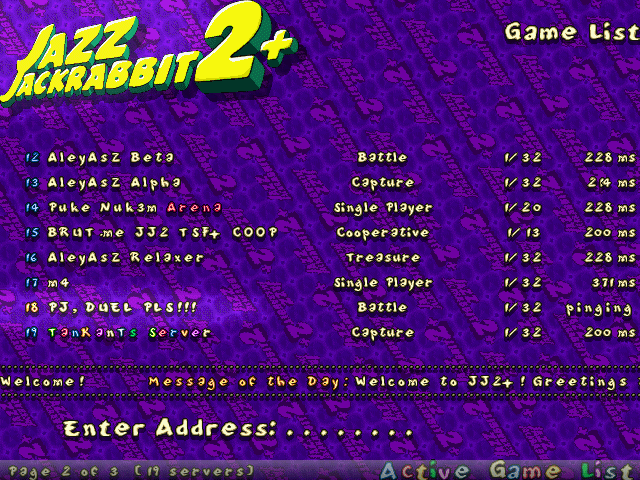 Before that, it was OK.
For example, I could always see who was in PJ's server and he is hosting on 1.23. If this is what I think it is it's an issue with SGIP, not JJ2+. I sent an update that fixes it to DJazz a while ago but looks like he hasn't had time to deploy it yet. Also, sometimes it doesn't update the players count until I do /relist. This message has been deleted by Stijn. As far as I can see this is not a bug in JJ2+, but an unfortunate side-effect of the list server not displaying servers with a max player limit of 0 in the server list (because no one will ever be able to join that server until the limit is increased). I'm not sure this is something that needs fixing - can you give me a scenario in which someone would want to host an idle server that no one can join but should still be listed in server browsers? Just pointed it out. It probably doesn't need to be fixed. But Camel admins might have to find a solution if players want to be annoying and set /maxplayers to 1 and leave. How is that a new problem? Surely a server that can only include 1 player is exactly as unjoinable as one that goes up to 0.
and what exactly information else are sended, that could be added into the table in extended information past the version of the game? That level filename at the end is kind of awkward, oh well. I can't really tell at a glance what exactly broke your script, but the old way of getting player info was always a hack and you should switch to the new method if possible. Last edited by Stijn; Jun 10, 2017 at 01:22 AM. Seems as if the new version works perfectly fine. Just a quick idea, what if the file downloader was fixed from 20kb/s to 1gb/s? That's a good idea, but I am not sure if the staff team can change it that easily, but if they can, they should do it. I don't think there is such a cap, though. Sir Ementaler tried joining a random server and got about 46 KB/s. I just tried downloading a file from my own server and got about 531 KB/s. I have problem with this version. When i enable the "Beta Sprites" from Plus menu the crashes the game but i change the "Beta Sprites" within the plus.ini file to True the game is works fine. Last edited by burnout92; Sep 11, 2017 at 09:06 AM. Reason: I'm don't write the exactly filename. You need to use /list when that happens. No need to restart the whole server. Are you still using an older version of JJ2+? Would be possible to integrate JJ2+ with J20 so users could vote, explore and download levels Mario Maker style? Of course uploading would still need to be done manually, but this would make discovery and enjoyment of custom content easier. The site you're on, J(azz)2O(online).